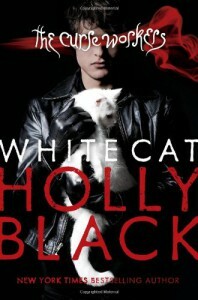 I'd never read anything by Holly Black before, but I'd heard really good things about her. I also really liked the covers for both this one and Red Glove (the second book, soon to be out). This is the first time I tried an audiobook and while it didn't bother me as much as I had thought, the experience was slightly different from reading a book yourself. I got the names mixed up more often and not being able to check back on something was a bit annoying. Other than that, I did really enjoy being read to. It takes longer to 'read' a book this way, but that's not such a bad thing. Anyway, on to the book itself: LOVED the magic system! "Working" your magic by touching someone with your bare hands has so many implications. Society is changed by it. People are horrified by the idea of shaking hands without gloves on. You don't let someone touch your bare skin, because they just might be Curse Workers and working you without your knowledge. Everyone can only do one thing: you might be a luck worker, memory worker, death worker, dream worker, emotion worker.. The list goes on, but you only have one thing you can do and you're born with it. Working is actually illegal and Cassel's mother was sent to prison for it. Cassel is troubled by two things: he is the only one in family who's not a worker and he killed his friend Lila 3 years ago. He remembers doing it and doesn't know why he did it, which makes him afraid to be alone with the girl he likes. He's afraid he might do it again. I believe that deep inside Cassel is a good person, he just likes breaking the rules/law a lot while being that person. His whole family has major issues and I think I'm going to love meeting his mother in person in the next book. I saw a lot of the twists coming pretty early on, but I don't mind that so much. The story flowed really nicely, there weren't dead parts in it and I kept wanting to find out what would happen next. Let me just say one thing spoilerfree: OMG, that ending! It's horrible! I can't wait to start Red Glove and find out Cassel will figure this one out!